« First Daring Bakers Challenge! I promise to start being healthy and all that stuff… tomorrow! Tehehe. As a fledgling vegan and avid baker/eater, I have been experimenting with different sorts of desserts. I made my first [vegan] ice cream. 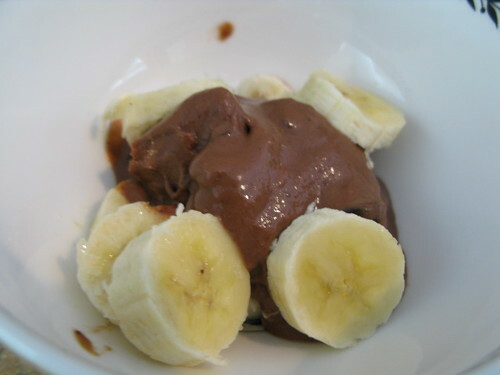 Chocolate peanut butter banana ice cream. It was supposed to be chocolate chip but I put them in too quickly and they melted… making it chocolate! When I came home after a week or so of painting the town, there was a whole bunch of bananas that had been left untouched. They were incredibly ripe (read: brown). While trolling the blog world, I came across http://veganicecream.blogspot.com, a wonderful blog devoted to… well, you can probably guess what it’s devoted to. If the above looks tasty to you, feel free to go to her site and look at some recipes. I don’t have an ice cream machine, so I just froze it while stirring every half hour and then put it in the food processor before devouring it. On a more interesting (and believe it or not, tastier) note, yesterday was my mom’s birthday. Which of course means… birthday cake! Her favorite dessert is strawberry shortcake, so I made her pound cake. Ain’t I a stinker? The recipe was taken from Veganomicon. 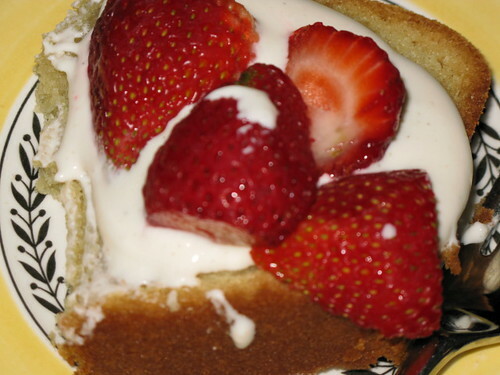 It’s the vanilla-yogurt pound cake (though I made it with strawberry yogurt). Very delicious! I highly recommend the recipe and the cookbook. I made a cream sauce that was quite fantastic. Put that on top of the cake with some strawberries and I promise it is better than strawberry shortcake. That ice cream looks wonderful! Doesn’t look like the chips melting hurt it at all, that’ s for sure! I love that Vcon poundcake- it’s so good…actually, everything I’ve made from Vcon has yet to disappoint!